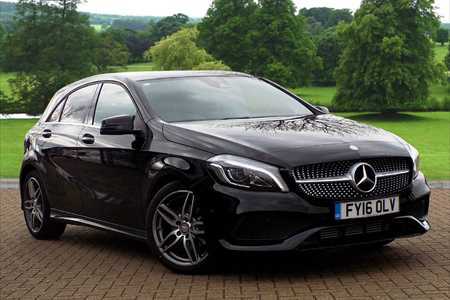 At the top of the small hatchback market sits a cleverly designed luxury model from Mercedes Benz. The A-Class Diesel models have been around for a few years but the latest model feels brand new, looks attractive and is rewarding to drive. Why would we want to buy one – especially with the variety currently available in the hatchback marketplace? We’ve got BMW, Ford, Audi, Peugeot, Mazda, Mini, Volvo and Volkswagen all providing excellent small diesel cars. There is something about driving a Mercedes that just feels a cut above the rest. It’s probably the three-pointed star, and the style that modern Mercedes cars have that sets them apart and gives them the edge on other perfectly good alternatives. With the new Mercedes Benz A-Class Diesel there are one or two other things that make it special; and we’ll have a look at these in what follows. Ride quality, particularly in a short wheelbase model is sometimes hard to get right. Cars with a longer wheelbase generally ride better and more comfortably, so when it comes to designing a small hatch with a nice ride the challenge are a little bigger. Mercedes Benz, in its quest for creating a dynamic A-Class hatch, has built a new car that offers a supple chassis with enough rigidity to handle well for maximum fun. Where the new Mercedes Benz A-Class Diesel shines is with the optional adaptive chassis control feature – a feature which is switchable between comfort and sport modes. Added to this is the clever Drive Select system which controls the engine management and transmission selections at the swivel of the knob on the centre control. What the driver can do, via the knob, is have the A-Class in Comfort, Sport, Individual and Eco modes, defining this new A-Class Diesel as the complete small hatch. You can be driving sporty one moment and then laid back and relaxed in comfort mode the next. With one switch of the button, you can be driving so smoothly over rougher town roads, too. This is a winner for the new A-Class Diesel hatch. Power from the Mercedes Benz A200 d is strong and lingering. Throughout the engine revs the engine will pull resiliently, and with a torque of 300 Nm available from as low as 1400 rpm, this little hatch is powerful and capable of handling a full capacity crowd in its spacious cabin environment. Not only does the smooth power come on low down but it continues to pull well through the mid-range. 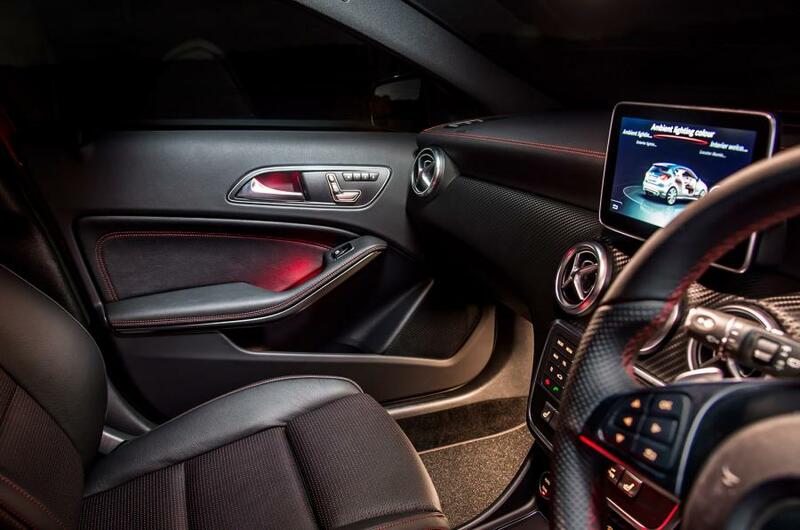 Rated at 100 kW power between 3200 and 4000 rpm, the new Mercedes Benz A-Class Diesel can complete the 0-100 km/h dash in less than nine seconds and run onto a top speed of 210 km/h. Efficiency is very good, placing the A-Class A200 d at the top of the class for fuel economy. In the real world, the A-Class diesel hatch should easily provide you with less than 5.5 litres/100 km efficiency. Power is directed though to the front wheels, while the gear changes are taken care of via the very smooth 7-speed 7G-DCT automatic transmission. For practical reasons, the Mercedes Benz A-Class Diesel does very well at accommodating its guests with premium comfort. There is some good storage throughout the cabin, and for luggage space the low boot floor enables 341 litres of volume to be filled with the rear seats up and in place. Split folding seats is a practical feature, and when the rear seats are fully flat you have 1157 litres. Luxury and comfort features are all there, and the stylish protruding touch screen manages many of the modern features like satellite navigation, audio and communications. Zoned climate control works well, and the premium sound system is stunning. Five-star safety includes some brilliant features that work to prevent an accident from happening in the first place. In the event of an accident, the new A-Class is equipped with a superbly strong shell that cocoons the occupants in a collision. Throughout the cabin an array of airbags cushion occupants. So to maximise the safety of the 2016 Mercedes Benz A-Class there are numerous standard and optional features that include: three-stage Electronic Stability Program (ESP), Adaptive Highbeam Assist, Adaptive flashing brake lights, Active Parking Assist, Attention Assist, Adaptive Brake with HOLD function, Hill-Start Assist, priming and brake drying function in wet conditions, Collision Prevention-Assist, adaptive cruise control, a tyre pressure monitoring system, a reversing camera with dynamic guide lines in media display, Lane Keeping Assist, and Blind Spot Assist. Breaking out of the mould is easy when you buy a special new A-Class Diesel hatch. The A200 d provides the owner with a rewarding, comfortable drive in plenty of style. If the diesel A-Class isn’t your “cup of tea”, then there is a huge range of petrol versions, too. For any more information on the new Mercedes Benz A-Class diesel or, for that matter, any other new car, contact one of our friendly consultants on 1300 303 181. If you’d like some fleet discount pricing (yes even for private buyers! ), we can submit vehicle quote requests out to our national network of Mercedes Benz dealers and come back with pricing within 24 hours. Private Fleet – car buying made easy!